The giant robot has sacrificed himself so we can progress. The first place in the new area is a dragon shrine, where Kurisu can fight to prove himself. It's a one-on-one fight but with enough healing herbs it's no problem. 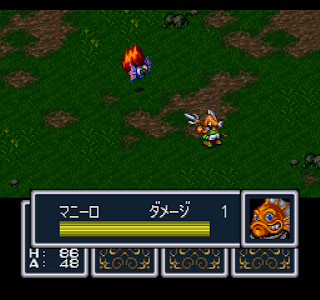 After defeating him, Kurisu gains the power to transform into various dragons in combat. This is a very helpful thing to do in boss fights, but his MP aren't really high enough to make it viable otherwise. The next location is the Town of Light, where we immediately get thrown into jail on suspicion of wanting to steal the town treasure. A grey-skinned man breaks us out (and will do it over and over again if you keep getting captured). 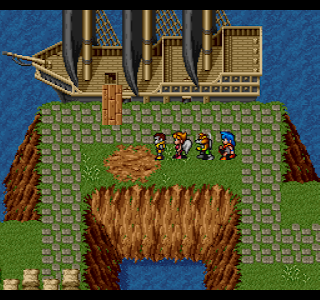 Talking to the town leader, we begin another nested fetch quest -- the ultimate goal is to unlock the safe where the guy's daughter is trapped and get the man's ship in exchange. This requires a thief. 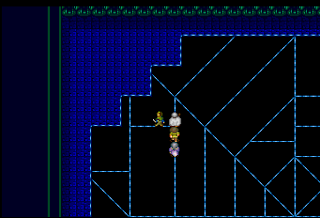 In the next town, the town of darkness, we learn that a master thief is training in a crypt across the desert, which requires an Ice Fan to cross. The guy offers to give us one for a gold bar. The gold bar costs 65,000 and I only had 25,000 so I figured there must be some way to get one, but I couldn't figure it out, and had to look at a walkthrough. As it turns out there is no trick, you actually have to make 65K. But there are several events you can do in the Dark and Light towns to make a lot of money, and there's a Gold Tiara that sells for 13K. So buy the gold bar, head back to the Dark Town, and trade it for the Ice Fan. Then we can cross the desert. 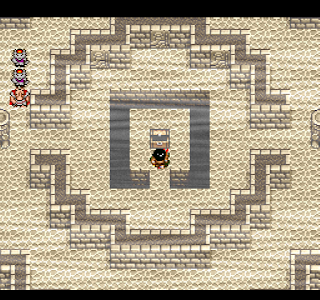 So now it's off to the nearby tower to get both the Dark Key and the Mirror of Hades. With the mirror I show the man's dead wife to him and he finally agrees not to turn over the light key. So now we finally have a ship!....for about 5 seconds, then the Dark Dragon armies destroy it. Fortunately we can steal another ship from a nearby fort. A sea creature called Maneelo, who speaks in Kansai dialect, tells us about this and offers us gun powder to open the fort in exchange for another gold bar. Fortunately there was one in a cave along the way so it's not necessary to make another 65K. This requires defeating a bunch of Dark Dragon soldiers, and eventually their commander, an octopus or squid monster. Now we have the ship, and Maneelo will help us pilot it! 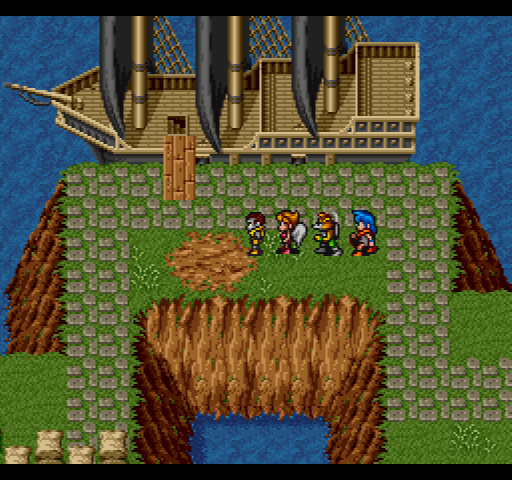 So off to the high seas...for about 5 seconds, until we get surrounded by Dark Dragon ships. The ship is boarded, but Maneelo has a plan -- blow up the ship using the cannon barrels in the hold, and Maneeloo will carry us to safety. Along the way, the next boss is the brother of the squid boss earlier. His "0 hp" message is "Tears come to his eyes!" I thought that was in reference to his brother but I've seen the same message for other monsters so you don't have to feel sad for him. The ship blows up, and Maneelo carries us to the safety of a desert island. How are we going to get off? Well, Maneelo can go back to his home town under the sea and get something that lets us breathe underwater, but we have to pay him 100,000 gold. Or give him all of our stuff, so that's where we end up. 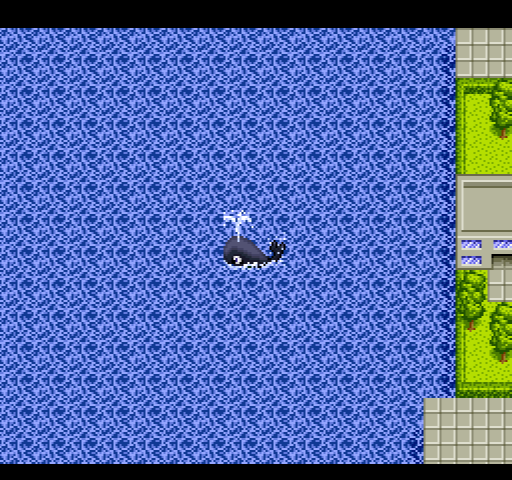 Now Maneelo is alone, and I thought this part was kind of unfair because the enemies under the water are way too strong for him. I immediately got a game over, but fortunately that sends you to Makka, the town you're trying to get to. Makka is a trading town with a bunch of stores, and Maneelo can set up a shop himself and get and sell items. Apparently this is a way to get some rare items and the strongest weapons in the game for a few people. The leader won't give Maneelo the gills, though, because they haven't gotten any shipments from Gantz. 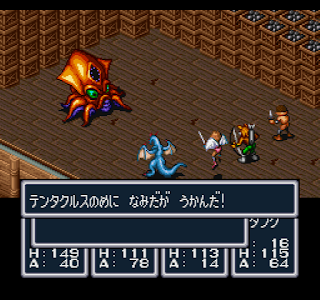 So Maneelo has to go by himself -- in Gantz, the people have all been taken away by the Dark Dragon clan but for now we just have to return the items and get the gills. There's also a problem -- the Clan attacked some of the Gantz people and one escaped, but the Grim Reaper is hovering over his head. Maneelo accepts some money from the leader to bring back the main characters, who beat up the Reaper. The Gantz person, Bilder, joins the party, and now we can bust through walls if he's at the head. After going back to some previous areas to get the treasures behind the walls, it was time to save the people of Gantz. We can break through the walls to get there, but there are too many troops. So it's time to backtrack, fetch quest, and finally end up with a Cockatrice egg, which leads the Cockatrices to the fortress. 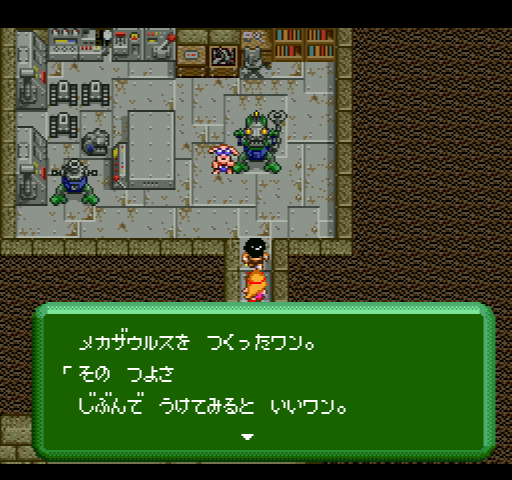 Now it's an easy task to beat the boss and save the men -- but we still need to destroy the weapon that the Gantz men were captured to work on. The suggestion is that a sleeping magician in the wandering city will help us. I saw this city in the desert earlier when I was getting Dank, and now with the help of an item from Makka I can finally enter it. 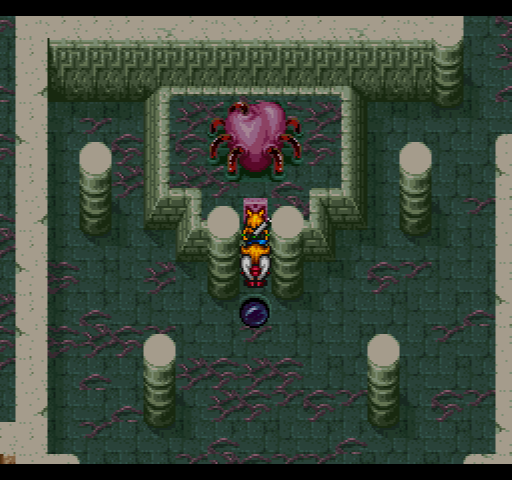 After beating some guardian spirits, who seem rather apologetic, Deeth (Dees?) joins the team. She's very rude and blunt spoken, but she gives me an egg. If I drop it in lava it will grow into a monster that will attack the ships with the powerful weapon on it. 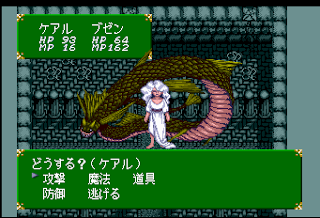 This goes swimmingly (after a tough boss battle), and the weapon is destroyed. 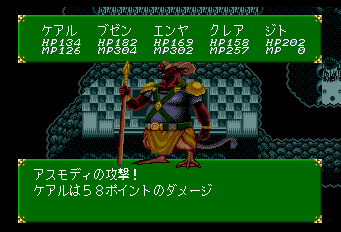 Afterwards there's a cutscene with Zorgon, the leader of the Dark Dragon Clan, and Judas, his underling. One of the big plot holes that is in many RPGs is that the final boss often knows the heroes are making progress but does nothing directly to stop them, and there's often no real explanation for why. 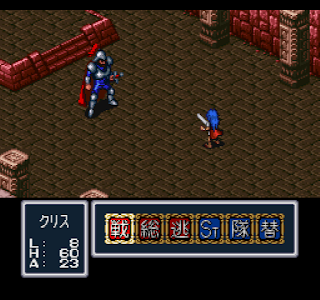 Judas, too, farms the job off to his Shitenno (four kings, as usual) rather than just going in and beating them down. So this seems like a good place to stop this post -- I'm well past this point so I should be able to finish this week. So this is probably the most well known game I've covered on this blog so far. I'm not sure why I never played it when it came out -- it may be that by this point I was already more into computer RPGs than console ones. It's possible I rented it and played a bit of it but I don't think so. I played the first sequence and then watched the English on youtube and from what I could tell the translation is pretty good. Of course the biggest flaw is the space limitations on the names. Any name that is above 4 characters is changed (e.g. Gilliam becomes Bo). The items often have inscrutable names because of space limitations, so that Iron Rapier becomes IronRP and Tears of Bem becomes T.Drop. 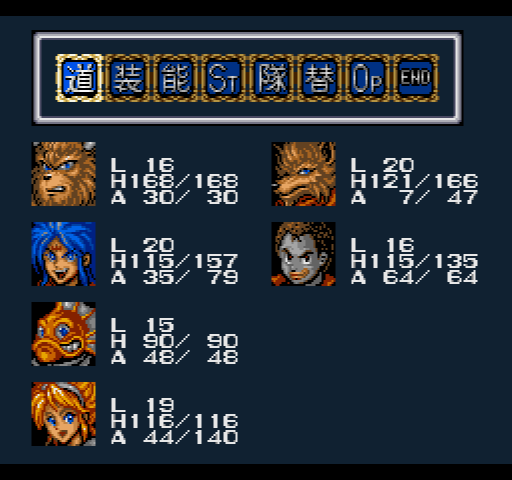 The oddest ones are names that sound like debug menu names in English (Mrb13 instead of Protection Smoke). 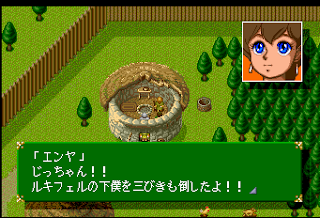 I think this was true in Paladin's Quest (Lennus) as well. 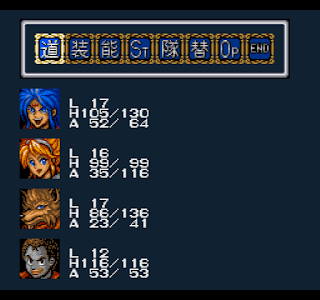 I always wondered whether this was primarily rushed and underfunded localization or whether there are actually serious problems in trying to expand the space for the names. Moving on. 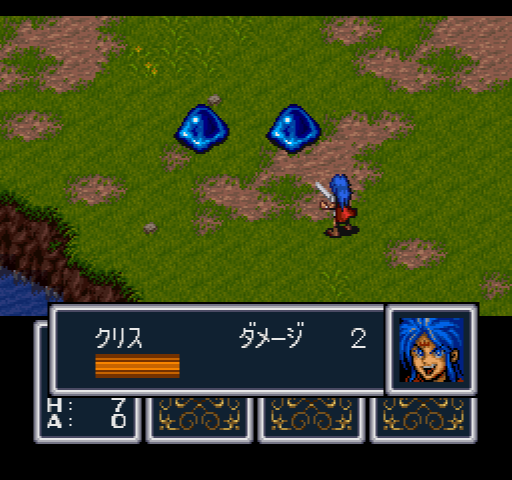 Overall this is basically your standard RPG of this period; I notice that the game has not aged well and a lot of people criticize it now. I can understand this, but having played the previous 22 games on this blog I can really appreciate how good this is compared to the other games available at the time. 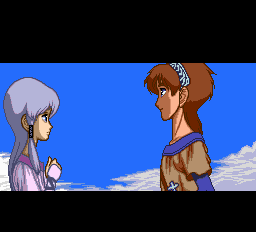 Sometimes games don't fully engage me through the entire experience, but as of now this is shaping up to be the best game I've played on the blog next to Dragon Quest V.
The game begins with the main character, who I named Kurisu as usual. 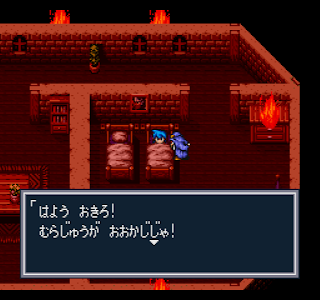 It's almost a metajoke, I think, how many RPGs begin with a relative waking up the main character. Did this start with DQ3? The town is on fire because of the attack of the Black Dragon Clan. Kurisu and his village are descendants of the White Dragon Clan. Kurisu's sister decides to turn us all into stone and fight off the attackers herself (she's lucky they didn't come in and smash the statues). Once everyone recovers, Kurisu decides to get revenge for his sister by taking out the Black Dragon Clan. The graphics are pretty good, as is the music. The interface is great, and you can assign all the buttons different functions. Unfortunately the walking is very slow and there's no dash button. 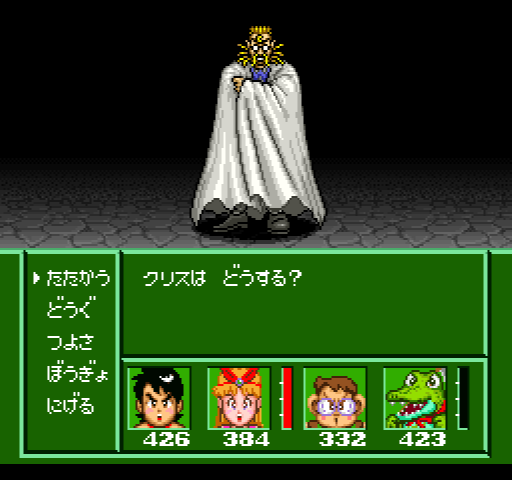 The nearby town has a haunted castle that the king wants you to clear. This is a nice easy starter dungeon with a lot of HP restore places and a boss that's not too bad. The battle system is the typical attack-magic-item-defend (AMID?). 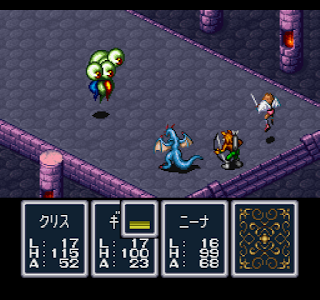 You can see enemy HP but bosses always have some extra unspecified HP after they get to 0, and often once they get to that point their attack patterns change or become fiercer. So there is still some uncertainty in the system. The first major goal of the game is to get a ship so we can get off the first island. This game is big on nested fetch quests -- that is, you need A, but someone wants B to give you it, but then you need C to get B, and D to get C, but you have to pass E's trial to get D, etc. Nanai is a hostile town so I have to enter at night, and avoid the soldiers as I make my way to the castle here, to stop something that's causing earthquakes. 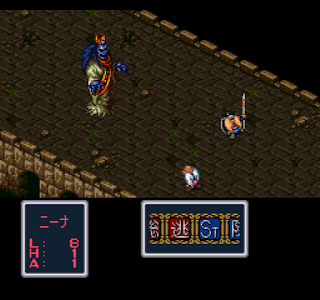 The boss inside is a Knight, who isn't that bad if you throw all your damage items at him. The entire town is destroyed by an earthquake after this, and all Kurisu can do is proceed to the next town, a town of winged beings. Here I am unable to meet with the king because he's gone, although I overhear that he's actually sick instead. Kurisu goes to sleep and the game switches to Princess Nina, the king's daughter, along with two knights that accompany her to find a medicine for her father. Nina is a healer-type character but also gets an early attack boost spell, which is a big help. Her story involves several dungeons, but eventually she reaches the tower where a magician holds the medicine that can help her father. Kurisu easily defeats the magician, saving the king. 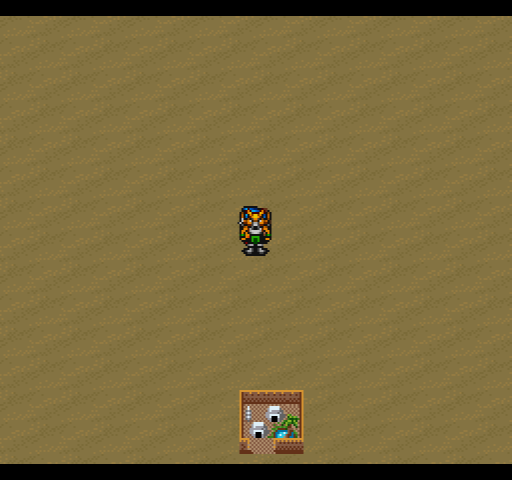 Now he is ready to move on to the next area, and Nina decides to join him. Next up is Tantar town. We're closer to getting to a place that has ships, but a rock has blocked up the river here and the bridge has been destroyed. Tantar town has wolfmen, and Tontor has humans. We have to head out to a forest dungeon to try to see if we can remove the rock. 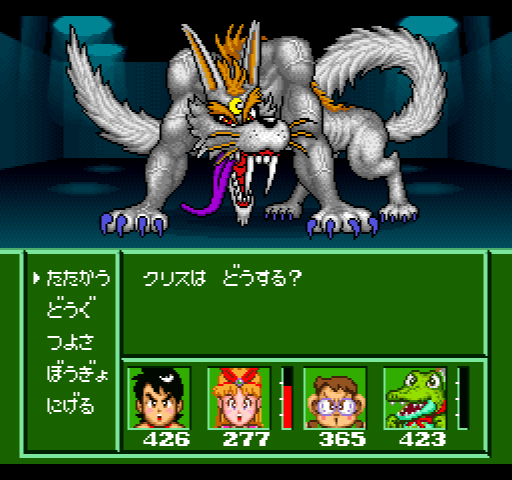 The boss is Pochi (translated as "pog" in the English version; they should have used a stereotypical dog name like Rover. Once Pochi goes down we get the third party member, Gilliam ("Bo" in English). He's a wolfman archer with some helpful spells. Also if you put him at the front of the party, you can walk through forests and shoot the animals that you sometimes see on the world map. This is one of the few distinctive features of the gameplay. 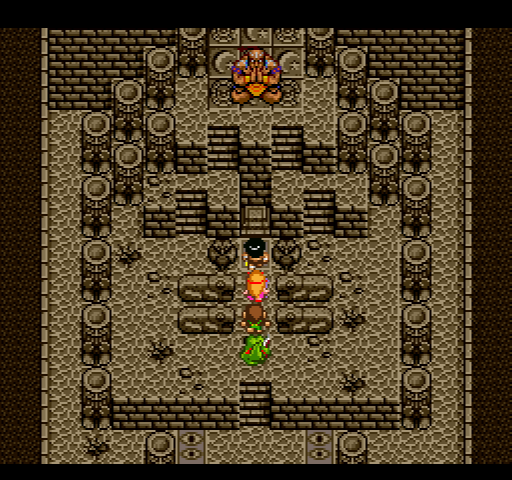 It looks like to move the rock we're going to need to re-activate an ancient stone robot, so it's off to the floating city to get the key. 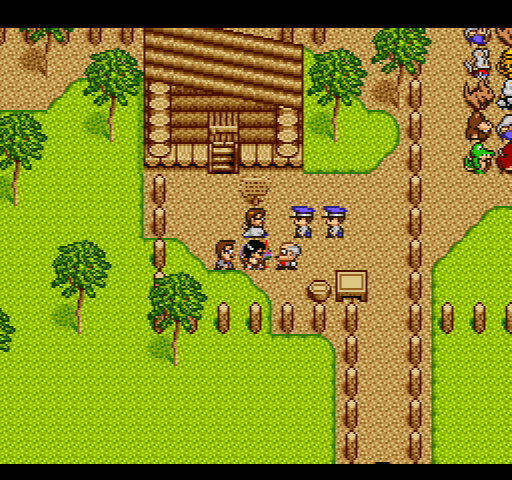 But to get to the floating city we need a stone tablet from Romero village, a village of zombies. The person there won't give us the tablet unless we get Cleansing Water from an underground cave to cure the zombies. Phew. After this Russian doll of fetch quests, I got the key and headed to the stone robot. 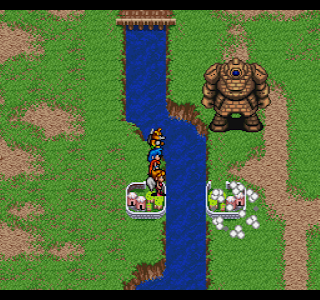 Now with the robot, we can blow up the rock and restore the river. I think I'm going to stop this post here; I'm somewhat past this point, but if posts are too long they get boring. I'll write several posts this week to catch up to where I am. 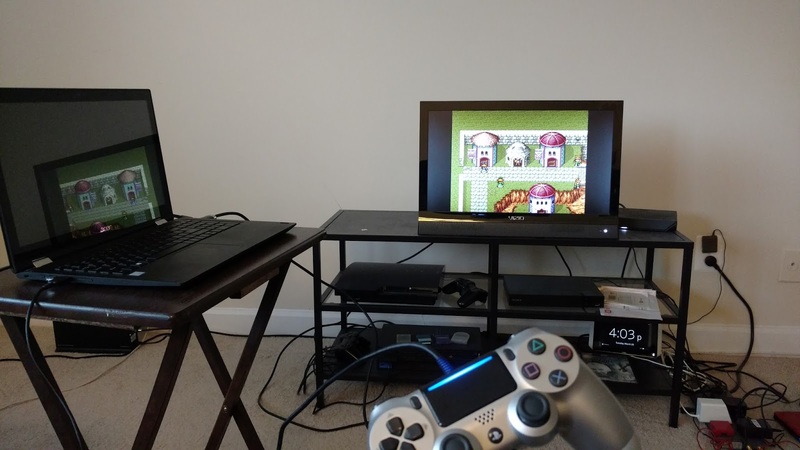 I tried hooking my laptop up to my tiny TV today, it works pretty well. It feels more like I'm playing a classic console game than an emulator. I haven't done this so far because I often watch some sports while I'm playing, but with basketball season coming to an end I might be doing this more. Hey look, I actually completed a PCE game. It's not especially good but it's short, and since the second game continues off the first I thought it was worth finishing. It's what you would expect from a game of this era -- standard, DQ-style RPG with little to distinguish it from other games. The title means "Song of the Angel." The art is not the greatest -- Claire's hair is big. 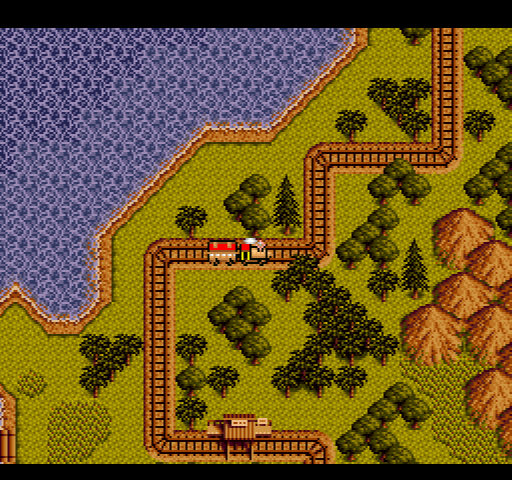 It also follows the pattern of a lot of the CD RPGs I've been playing in that it has some cinematic scenes and voiced dialog, but not much. 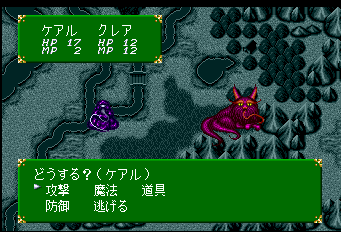 Tengai Makyo and Cosmic Fantasy seem to have put a lot of effort in that area whereas the games since then have not. The music of this game is fairly good, although there's still the common problem that the music not being played off the CD (e.g. 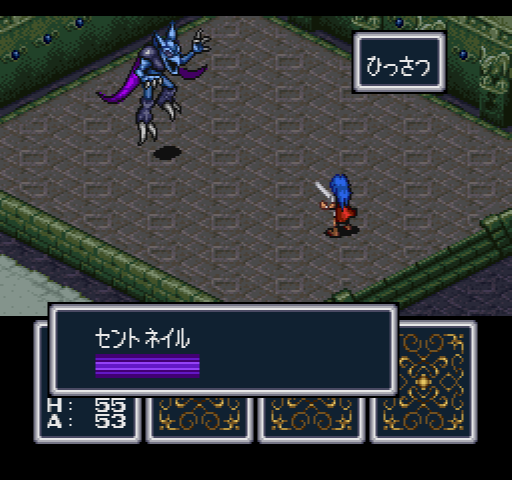 the battle theme) is significantly lower quality than the CD music, and has a harsh sound in comparison. It also seems like the volume isn't consistent and the harsh battle music is much louder than the map music being played off the CD. The figures on the map are very small. 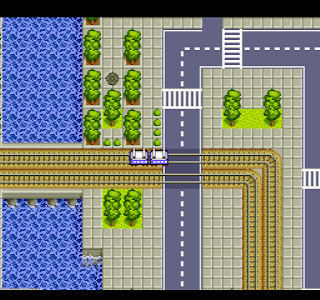 The most distinctive feature of the game is that it takes place in something similar to the real world. You begin on "Erin" (i.e. Ireland) and then go to Brittania. Many of the locations are at least based on real world locations (like Portsmouth or Glastonbury Hill), but I was not able to tell whether the map actually looks like Great Britain. This also comes with an intriguing setup where Christianity has gotten a strong foothold in the region but the druids and ancient gods are still around. Unfortunately this aspect isn't developed very well and it was never clear to me how the "angels" of the title and the heavenly beings related to either of these real world religions. 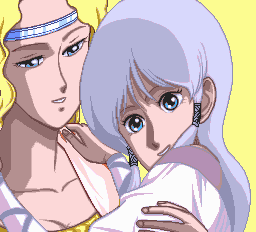 The main character is Kearu (Cure in Final Fantasy), who wants to go to the castle with his fiance Claire to have their wedding blessed. Along the way she gets captured by a demon, who Kearu learns is working for Lucifer. So the first task is to save her. Along the way we pick up some of the other members of the party. 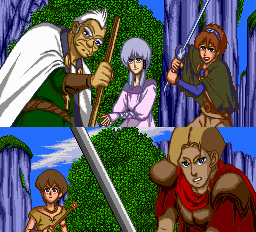 Buzen is an older magician, Enya a young celtic woman, and Jito, a swordsman. 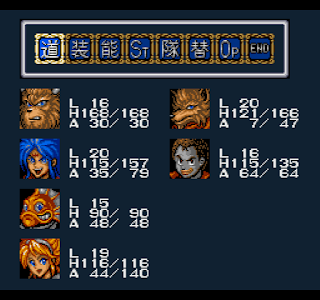 The party is unbalanced because Jito is only there for part of the time, so for much of the game your party is a fighter and three magic people. Like most games of this era you have to save a good amount of your MP for boss fights. 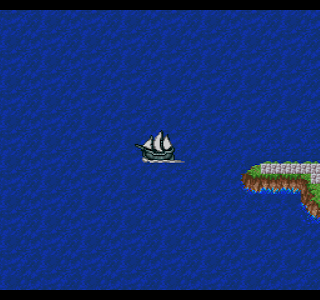 The first task is to make it off of Ireland, which requires calming the sea by beating some bosses. Then you get a ship. At least this game has a run button, which even works on the ship. 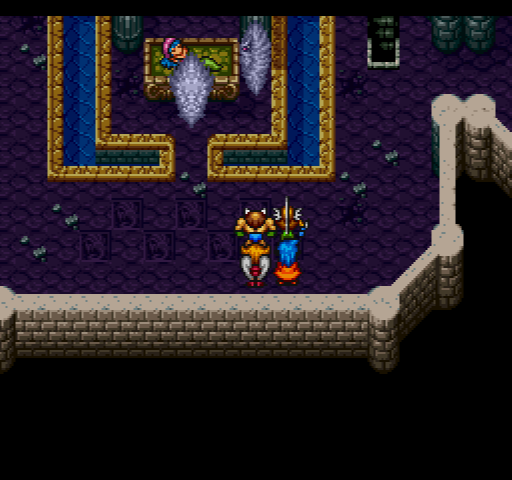 Eventually we make it into the tower where Kaim (the demon that stole Claire) is. 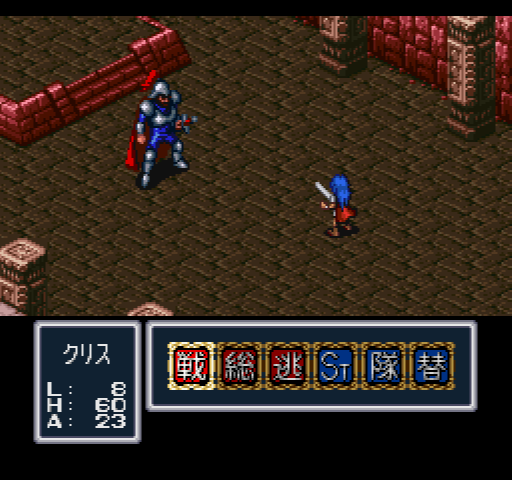 Even though the first fight against Kaim is an automatic story event loss, when you actually fight him for real he's easy. It helps that Jito gets his strongest weapon very early in the game, for some reason. 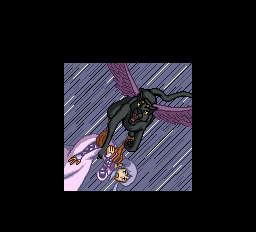 After saving Claire, we learn that Claire is the descendant of the heavenly beings, which is why Lucifer wants her. Meanwhile Jito found his wife as well, so he leaves for a bit. Now the game turns into the normal idea of defeating Lucifer, but that requires travelling around to find various angel artifacts. First we need two mirrors. We can find the Lu Mirror at Stonehenge. 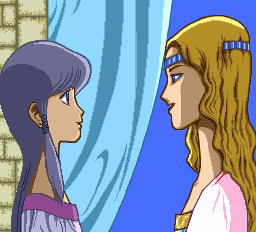 The other mirror is held at Exeter Castle by Queen Hermes, but she refuses to part with it unless we defeat Pluto in the nearby Glastonbury Hill. Jito rejoins here, which is welcome since he adds much needed power. Unfortunately, meanwhile Lucifer has burned down Enya's town, killing her grandfather. The next step is to pick up a thieves' key from a thief town so that we can open various doors that will block the way, and then another ship, to go north to the snow-covered area (Scotland?). 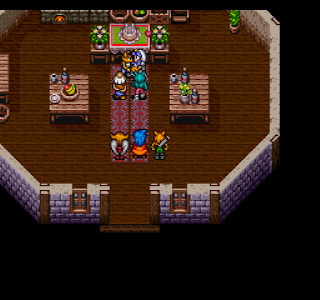 One thing that occurs several times in this game is having to talk to various people in a town to solve a mystery -- whether it's your money being stolen, or an important item being stolen or broken. This is a welcome relief from the usual fetch quests. The major quest remaining is to activate four cross statues around the world to gain access to the heavenly kingdom. First we need a Milky Way Drop to convert our ship into an airship, which requires seeking out and defeating Asmodeus. Unfortunately Asmodeus kills Jito (which I don't have a screenshot of), taking away an important source of damage for us. Nooo! Next we need the Angel's Whisper to activate the Cross shrines. This just requires solving a small puzzle at Chepiot castle, and the four Crosses are in various towns around the world. 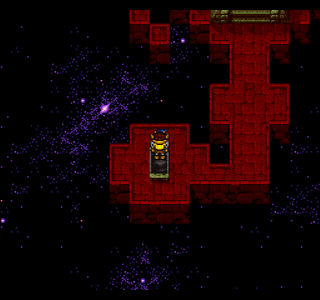 So for a while there's no dungeons or anything like that. After activating the Crosses, it's up to the heavenly land. As I said before, it was never clear to me how this is supposed to relate to Celtic or Christianity but maybe I wasn't paying close enough attention to what the townspeople said. Up there Kurea receives the strongest equipment, and we meet Claire's mother Maria. She gives us the Angel's Tear. 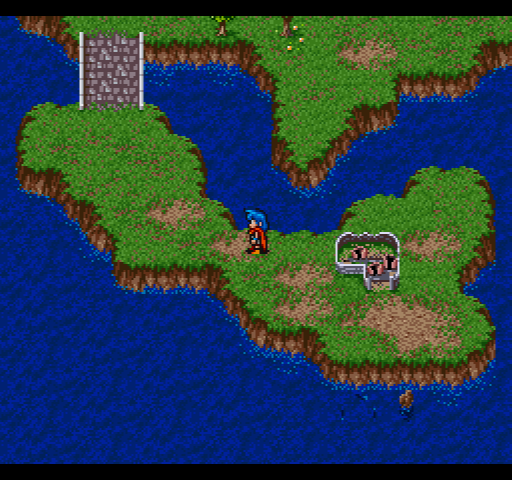 Heading back to the surface we find a spring that has the voice of Claire's father, who gives our ship the ability to cross mountains, opening the way to the final dungeon. This also heals HP and MP so it's a good place to level, but the monsters give too little money to get everyone the strongest equipment. 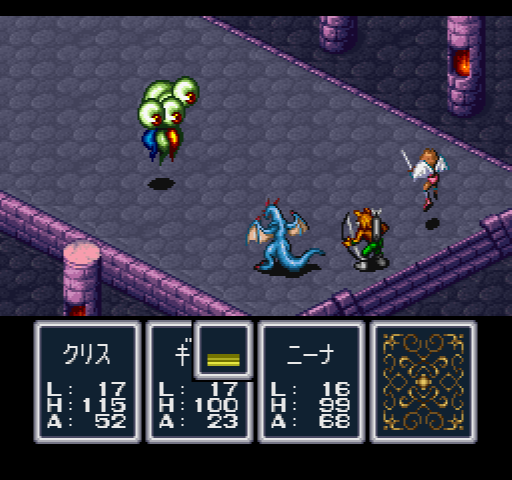 The final dungeon has all the previous bosses, but they're all the same strength they were when I fought them the first time. So they're pushovers. Lucifer himself is not that hard -- you can seal his magic with Buzen's spells, which helps a lot, and from there it's just a matter of buffing and healing. 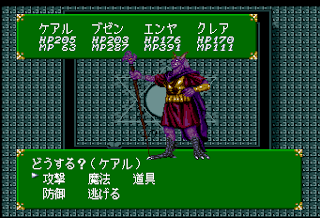 He's got a lot of HP but his attacks aren't that bad. 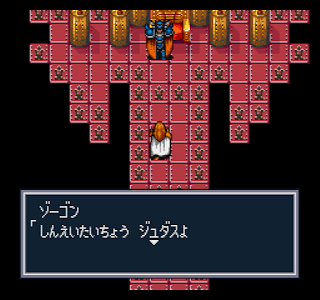 In the conclusion, Claire sacrifices herself to seal Lucifer away, and Kurea walks away in sorrow...the end. For 1991 this certainly is not a bad game but it seems like it has more potential than actual quality. 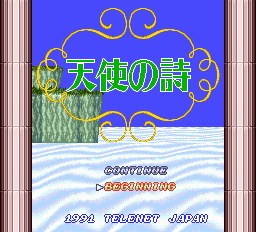 I'll be interested to see if they improve on the system in Tenshi no Uta II, and then in the eventual Super Famicom third game. Next up is Breath of Fire, a game I imagine some readers have played. Story/Characters: Don't expect much from this area. The story is a pretty simple A->B->C affair with little in the way of twists or surprises. The characters are also just sketches, with virtually no character development and only the slightest backstory. World: The world is a lot of fun. It's based on things like Tarzan or the Jungle Book, although they throw in technology, robots, and other stuff. 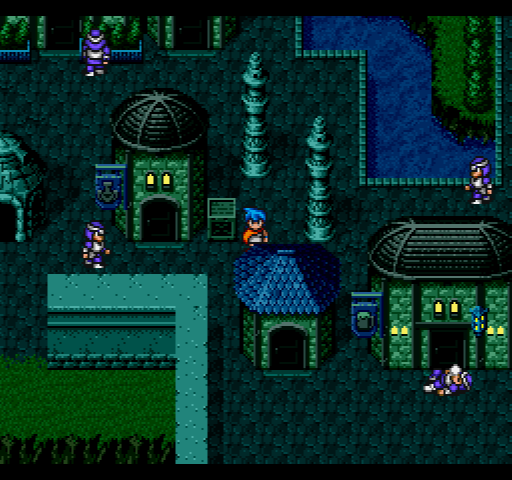 Each area has a lot of personality, whether it's the penguin kingdoms, the large City, or the "lake of tears." Game Flow: You have a lot of freedom in the order to do certain events, and you can nearly always find something to do just by exploring ahead. In this case it's a very easy game to play and keep interested in. 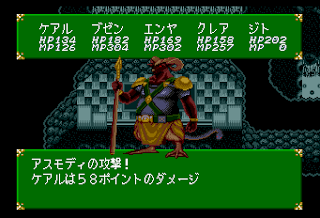 However, as I mentioned in the last post, the random encounter rate is a huge problem. Even cutting the rate in half it would still be too high. My feeling is always that if the encounter rate is too high, it makes exploring a chore rather than the fun it should be. 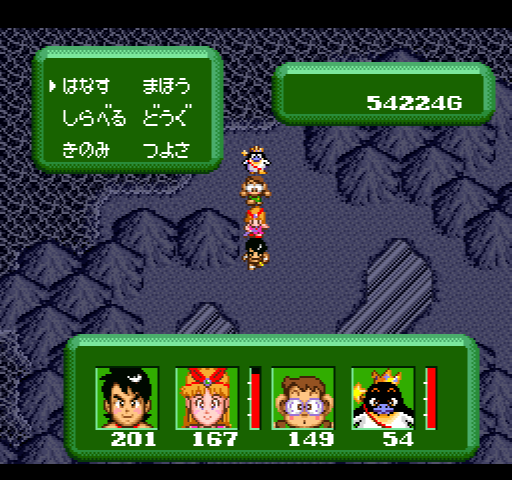 It also throws off the game balance because even though I ran from a huge number of the fights, I was still clearly overlevelled for the boss fights. System: Standard attack-item-defense-magic for the most part. Mio's MP are high enough that you can actually use her spells in random battles, which is always appreciated. Sasuke has special moves involving tree nuts and fruits, and he can also do random things to help in battle. 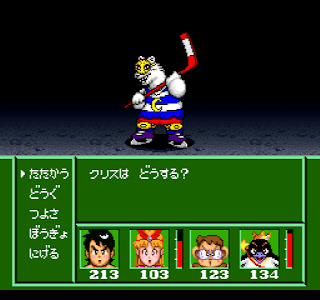 The 4th character you can choose, and they also often have pseudo-AI and random stuff. Side Quests/Optional Content:There are several optional dungeons and events you can do, as well as an auction, a tournament, and paying money to rebuild the railroad. You can even do all this stuff after you beat the game. 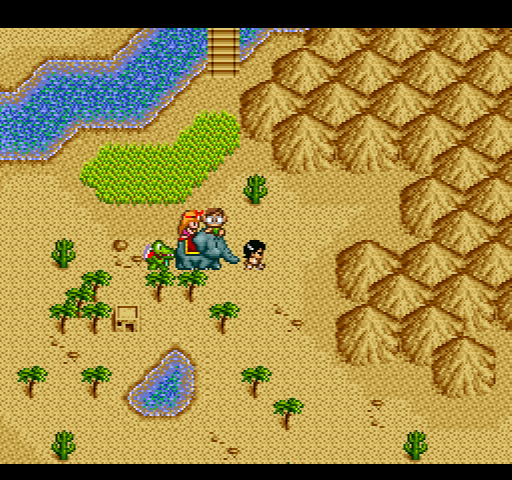 Interface: These games continue to baffle me. Final Fantasy IV is now two years old, and games are still being made that lack a unified "action" button, and where it's cumbersome to see what the stats of equipment are in stores. This doesn't seem like it should be that hard. 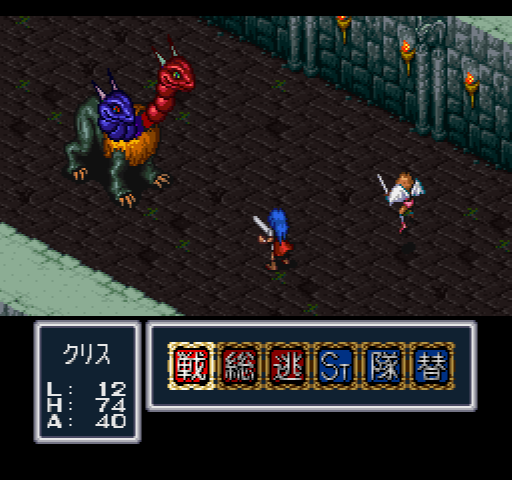 Even if the games are copying Dragon Quest, DQV had all this stuff. I just don't get it. 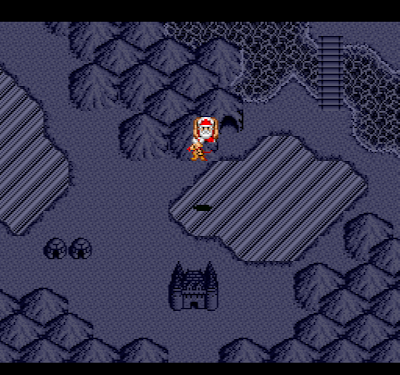 Graphics/Sound: The graphics are still basically NES-style with upgraded colors and such. 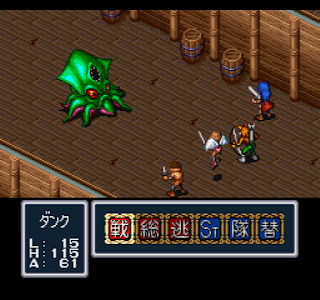 The enemy sprites are varied and creative, and there are few (if any) palette swap monsters. The music is servicable and sounds Jungle-ish but isn't too memorable. On the whole this is another Average game. I might have been able to push it to Good if it weren't for the random encounter rate. Perhaps it's a testament to the game's quality that even with that significant flaw, I was still interested in playing the game and was rarely forcing myself to play it. Next on the list is Dorabocchan Cho Makai Taisen. This game is debatable as an RPG. I think it fits my definitions but just barely -- however, since it came out in English (as Twisted Tales of Spike McFang) I will skip it. After that is Neugeir, which is not an RPG by my definition. 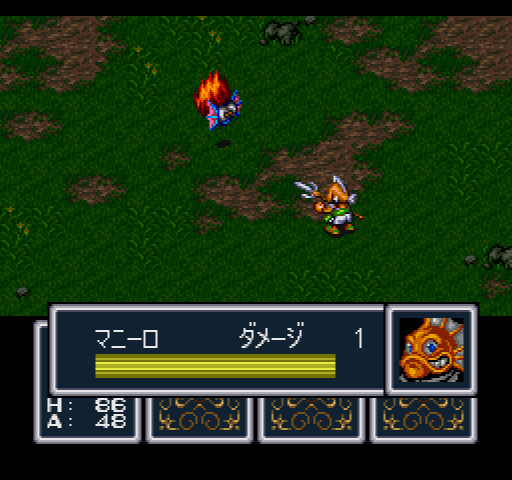 So skipping those, the next SFC game is Breath of Fire. 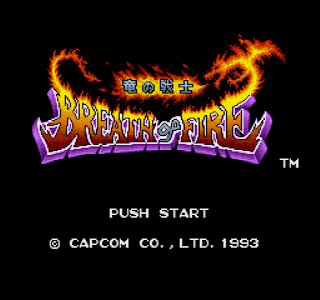 Even though this did come out in English, it's such a famous game that I'll at least give it a try. I also made some changes to the rules (on the rule page) but it's basically just clarifying what I was already doing. Basically it just says that if I try a game that has been released in English or that I've played before, I can stop if I want for whatever reason. Finally, I'm going to be out of town the next two weekends, so updates could be sporadic until April 1. 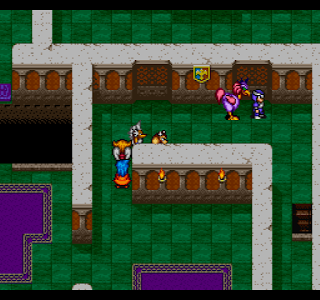 This game has two issues that make it considerably less fun than it could otherwise be. The first is the encounter rate, which may be the highest I've seen in any game to this point. In some dungeons you get encounters every 2-3 steps. 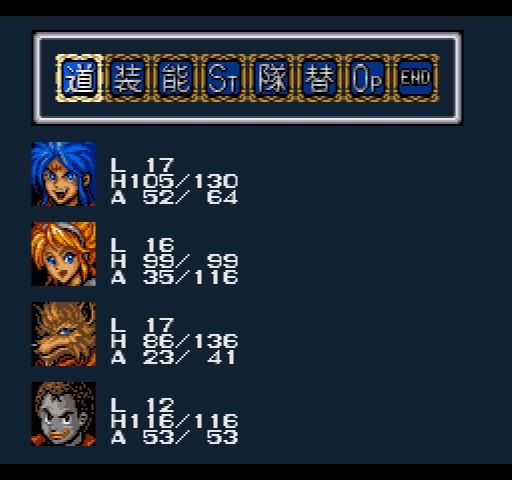 The second problem is that once again, designers have decided to make it a game over if the main character's HP ever get to 0. 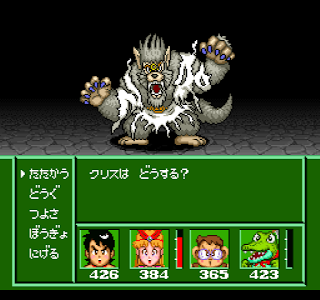 Since there are monsters that use instant death spells and do critical hits and spells that do more than your max HP, this means that at least a few times during the game you're going to get a game over just by pure luck. It's not as bad as some games since "game over" sends you back to your last hospital with some money subtracted. But it's still frustrating, and there are some bosses that require luck to beat just to avoid this instant game over. With that said, let's see how the rest of the game goes. In the last post I had gotten 4 of the 7 items necessary to revive Atimos, and headed north. There's a railroad on this continent that you can ride to various destinations. At the top of the land is the railroad office, which accepts donations to finish the rail line. Instead I just went to the airport and flew to The City, a big place at the NW of the map. The City is where Thomas is from, and we need to help him take on his nemesis Dr. Pochi, who has built a mech and is hiding under the city. Mio's father is also here, but he doesn't say much. This quest doesn't have anything to do with the overall story but you have to do it to be able to leave The City and go to the next area. 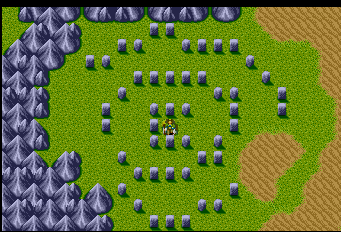 This is also where I found the random encounter rate to get really frustrating. The sewers here have encounters about every 1-4 steps. From here on out my basic strategy was to fight battles until Sasuke has enough speed to go first in every fight, and then run from everything (running is 100% effective). Finally I found Dr. Pochi and his mech under the city, and since I was so overlevelled from all the encounters he went down easily. Like most of the villains in this game he apologizes and he and Thomas clear up their misunderstanding. Apparently Pochi thought that Thomas had stolen his robot but he was just trying to help, or something. Now in the Zoo (yes, there's a zoo, with talking animals), we meet a whale who tells us about the trouble the penguin land is having. The Emperor and King Penguin are fighting a war against each other. Since the 5th magic item is there, I'm happy to accept the whale's offer to take me there. In the icy kingdom, we meet the penguin magician Marin, who says that the Emperor and King Penguin each think the other stole his crown, and that's why they're fighting. 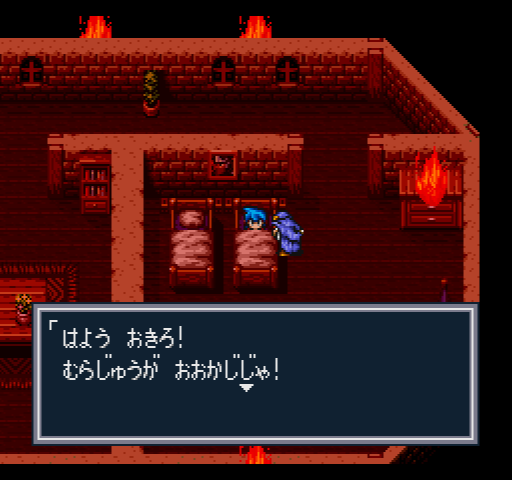 Kabura, the keeper of the Atimos item, has been imprisoned and we'll have to end the war to free him. 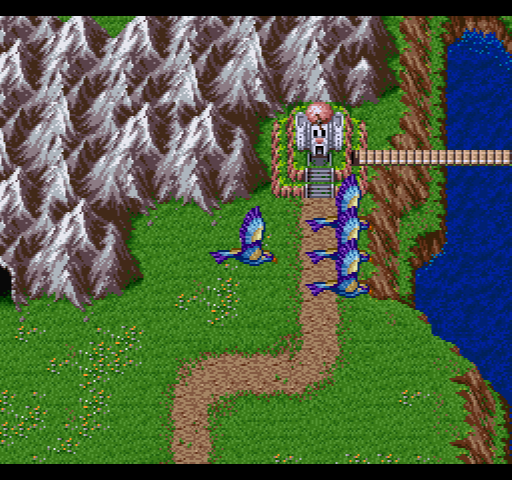 At this point I just couldn't take the encounter rate and used a walkthrough -- there are two mines with enemies, and the Emperor's town and castle also have encounters. Basically what's going on is that two members of the Uruuru group have stolen the crowns themselves and blamed the penguins. 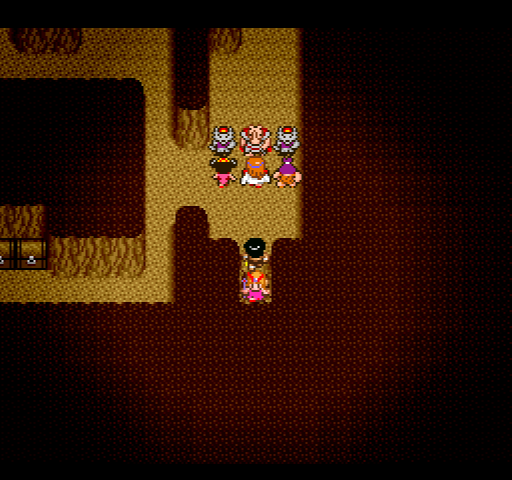 I had to unmask each Uruuru group member, fight them in the mine, and return the crowns. That stops the war and Kabura is able to give us not an item, but a word of control that we can use to control Atimos once he's been summoned. Unfortunately, the Uruuru group people overhear it. 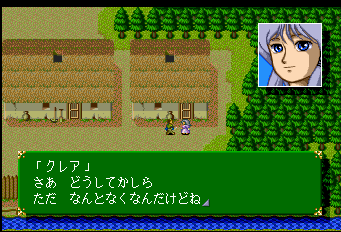 Now Kabura gets a friend of his, an old man with a reindeer, to take us to the next continent, where the last two items are waiting. Yes, this is exactly what you think. 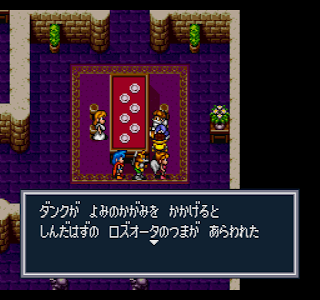 I arrived in a mountainous area, where the Uruuru members were hard at work -- they had apparently made a machine to replace the Dream Gem for opening the chests with the Atimos items. Also now if you lose a fight against some of them you also lose one of the items; I'm not sure how you get it back. 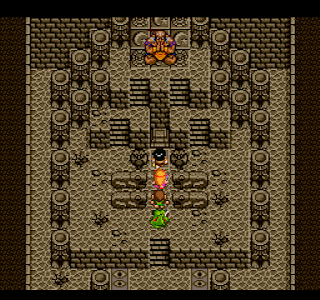 The panther Ranba tells us he hid his item in the Mist Tower, which I found to be the most tedious dungeon in the game. It's a long dungeon, and you're facing an encounter every 2 or 3 steps. There are also these bone monkeys that have very high speed so you can't run immediately, and they have annoying MP sapping attacks and a critical hit that killed my main character from full HP. I got a number of game overs on this tower, and had levels in the high 50s by the end. 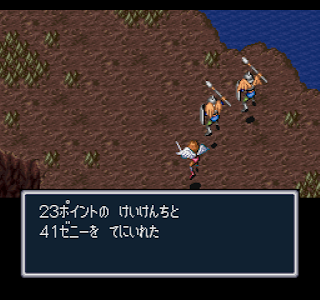 But, I did find the item eventually, and fought off the Uruuru group who came to try to take it. Now just one left, in the northern desert. There's a lake in the middle of the desert that has been made by some natural process involving an earthquake, that sank the ancient city of Atimos. There are a lot of little villages around the desert, and after upgrading my equipment and gathering information I was able to get the last item from a turtle -- after fighting both Uruuru factions in a row. Fortunately they're not that hard because Mio's lighting magic is extremely damaging and she also now has an attack up spell. ...except to cause graphical glitches. Now with all the Atimos items, it's time to revive Atimos. 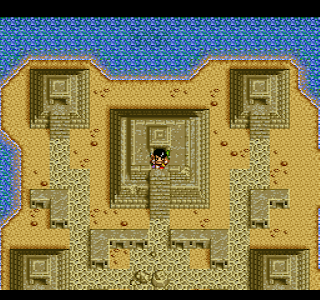 Sailing out to the center of the lake, I found a little temple jutting up from the bottom. Using one of the items restored the entire city. 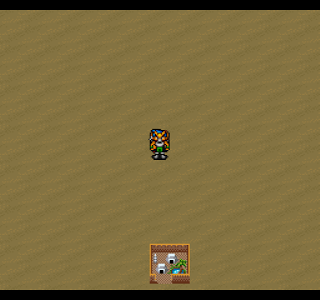 Now I could go in each small building and use one of the Atimos items, which opened up the way to Atimos himself. 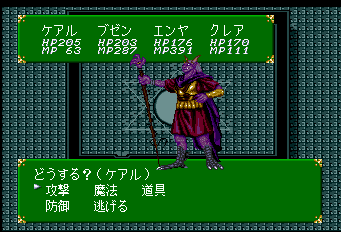 I used the remaining items in the temple, which revived Atimos. Speaking the word of command, he followed me (sort of like a genie) and fixed the lake so that the water would return to the desert area. 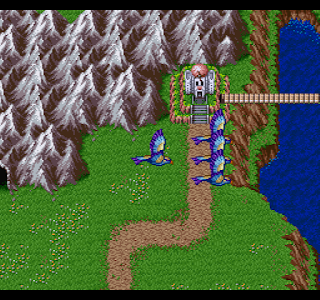 But then the leader of the Uruuru group comes in and uses the word of command to take control of Atimos, heading back to their base. Thus comes the last dungeon. 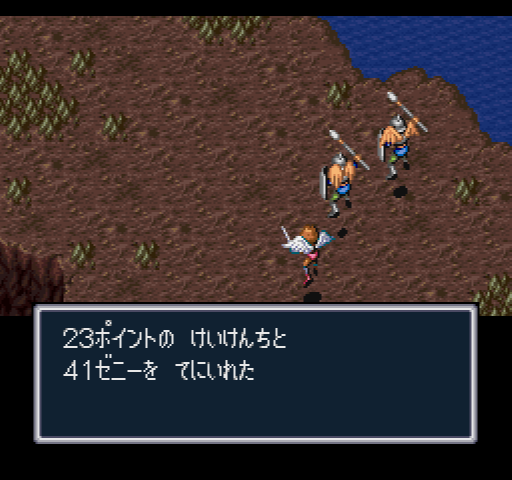 First I had to fight the Uruuru group members again, but they're still not very hard. In the base itself, they helpfully provided chests with most of the strongest weapons and armor in the game. At the top, we have to fight Atimos. He has two forms. The first is easy, but the second has a quake spell that takes everyone's HP down to single digits, and a lightning attack that often did over 1000 damage to my main character, which is an instant loss. It took 4 or 5 tries to beat him; I just tried again until I didn't get killed. 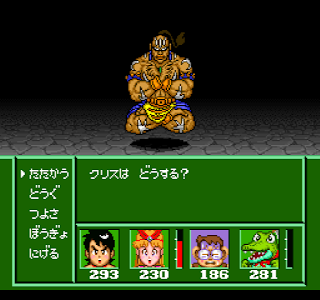 The last fight is against the Uruuru group leader. First his human form. He's not hard. 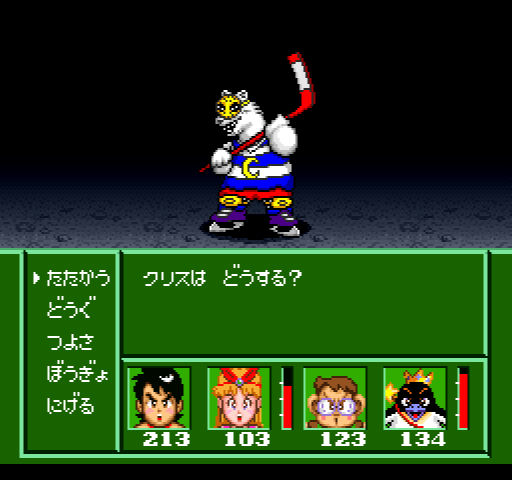 This is the last chance to heal and save, but I just went on to the last fight, which has two forms. I found both of these easier than Atimos. I just had Mio buff everyone's attack and then healed when I needed to. He does have an instant death attack but it failed every time he used it. Once he's defeated, like most of the enemies, he apologizes and accepts punishment. 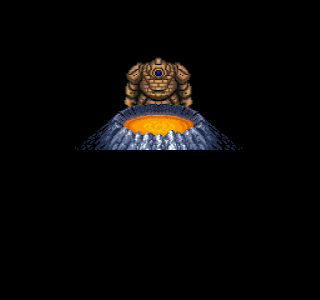 Atimos disappears, saying that he will return when strife and war are among the humans again. We lead him back to the jungle, where there's some backstory -- apparently he was friends with Jungle Papa and his wife at one point. I'm not sure whether I could have learned this via a side event. That's basically the ending, and then you still have control so you can participate in the jungle tournament, or finish the railroad building sidequest or play around with the auction. I should have seen whether different towns have unique dialogue after you beat the game. So that's Jungle Wars 2. 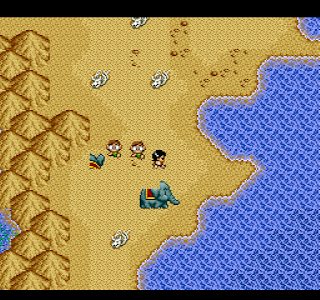 I'll do a review later this week, but this is potentially a good game with a huge flaw in the random encounter rate. It's still not a bad game, but it's disappointing.